A TEENAGER has been arrested in Dover in connection with yesterday's bomb attack on a tube at Parsons Green, West London. 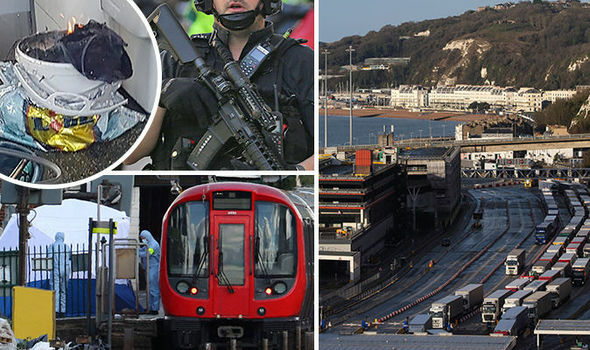 The 18-year-old man was arrested in Dover under The Terrorist Act in connection with the Parsons Green station bombing. The terror attack saw an improvised explosive device detonated on a London underground tube injuring 29 people. The man remains in custody at a local police station and will be transferred to a south London police station soon. Deputy Assistant Commissioner Neil Basu, Senior National Co-ordinator for Counter Terrorism Policing, said: “We have made a significant arrest in our investigation this morning. The Prime Minister ordered troops onto the streets on Friday night after a suspected Islamist placed a bomb on a packed train heading towards Westminster. Witnesses described scenes of terror and panic after the blast sent a “fireball” through a District line service in west London. Last night the Islamic State terror group claimed responsibility for the attack, according to the Amaq news agency which has links to the group. The Metropolitan Police have trawled through hundreds of hours of CCTV footage and 77 images and videos taken by the members of the public to try to identify who committed the atrocity. Mrs May said: “The public will see more armed police on the transport network and on our streets, providing extra protection. Parsons Green tube reopened on Saturday morning. Peter Crowley posted a photo of his ‘charred head’ on social media. He said: “I would personally say roughly about 20 who had physically injuries a lot of people who were shaken by the incident. “I wasn’t aware of the bag, I tend to keep myself to myself, I was side on to where I believe the incident happened.